As someone who lives in Elkhart County, I have a confession to make. I’m not a big fan of the city of Elkhart. Don’t get me wrong, I love Northern Indiana in general, and the city I live in (Goshen). Just…not a fan of Elkhart. So for me to make the trek downtown, I probably need a good reason. Hydraulic Ale Works gave me that reason. The new brewhouse, located in the old McCarthy’s restaurant, held their grand opening on Monday (April 8). I decided to stop in Wednesday after a work meeting nearby. I left there 3 hours later thoroughly impressed! Now, I had never been to the previous establishment, so I have no frame of reference to what the building looked like before, but all I know is that the first impression was that of a slightly upscale restaurant with the charm of your typical neighborhood brewery, if that makes sense. Their beer menu was relatively standard, as to be expected with a start-up brewery. They had six of their own concoctions available, and bottles of a couple other relatively well-known ales. 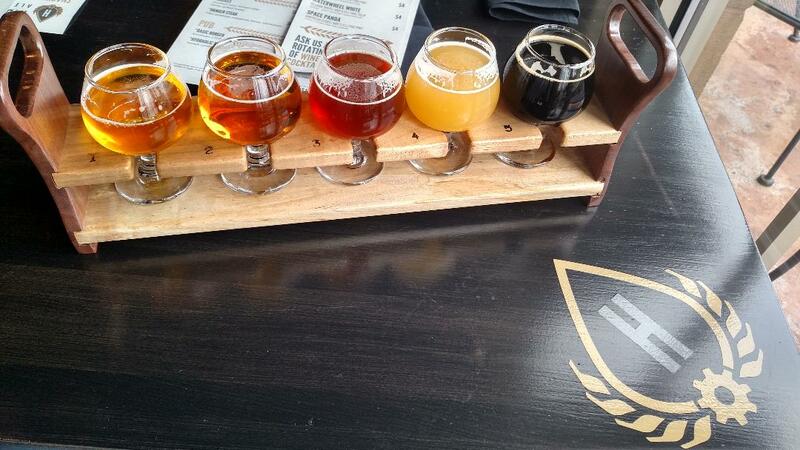 I ordered a flight as per usual (which allows you to sample 5 of the 6 beers available). I missed out on “Malevolence”, their Belgian Golden Strong, but when getting a flight, I view it as a marathon, not a sprint, so I passed on the beer with the highest ABV (even though it is a manageable 8%). As for the beers, they were solid. Hydraulic definitely leans into the Belgian style beers, which admittedly are not my favorite style, but that is just a matter of personal preference. I definitely finished the flight, so what do I know? I will say that my favorite beer is their Nucleation IPA. For a Belgian style IPA, it didn’t have that over-the-top dryness that style tends to have. I really enjoyed it! My second favorite is their American Stout, Space Panda. It is one of the fullest bodied stouts I have probably ever had, and it was delicious! If I am being completely honest, their food menu intrigued me almost as much as the beer did! I love a brewery with diverse food options. And while they have standard pub fare like a soft pretzel, soup, salad and burgers, they also have dinner options such as hangar steak and mussels. (Usually. They didn’t the night I was there, but I’m not a seafood guy anyway.) I went with the basic burger, and was very, very pleased. I’m a no-frills guy when it comes to food, so if you can do a good burger, you have a fan in me. As mentioned above, the building itself is very nice, with a combination of bar stools, table and booths available, allowing for plenty of seating available. 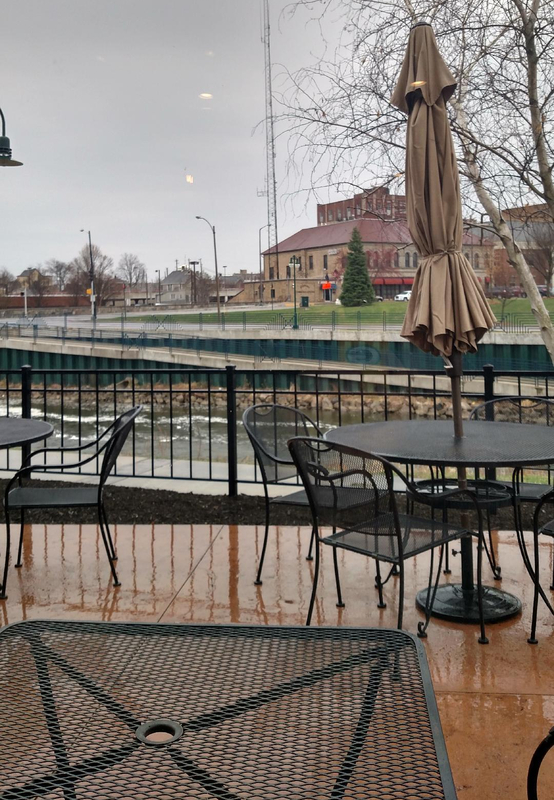 However, what makes Hydraulic stand out is a back patio that overlooks the Elkhart River. While Wednesday was not ideal weather for such a view, I surmise that it will be quite a hit this summer! I told you it was less than ideal weather. 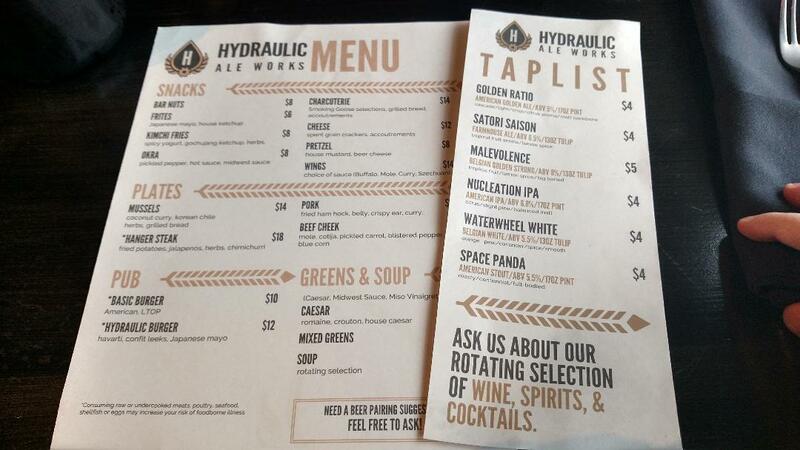 Overall I was very impressed with Hydraulic Ale Works! Usually when a new business is just getting off the ground, you can expect some hiccups. But I saw no such problems. And while it is not far from another brewery (the well-established Iechyd Da) the two are really quite different from each other in food, drink and ambiance. So in that regard, I really think they will compliment each other in “The City With a Heart” quite well! Who knows, I just may end up coming to Elkhart a lot more often now. 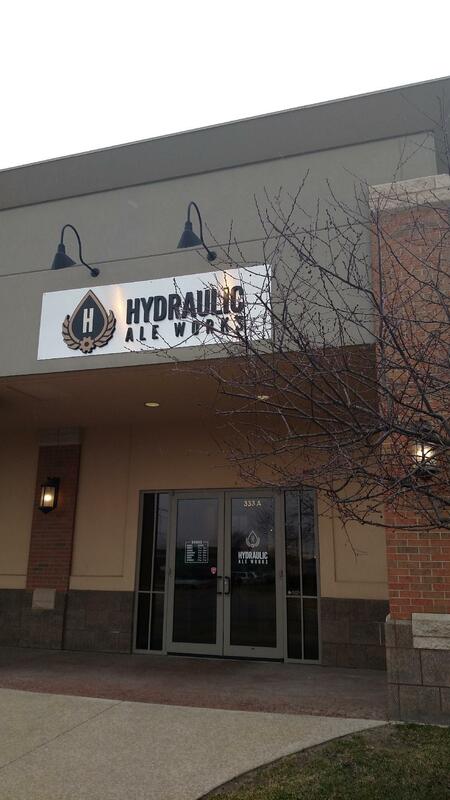 To see the interview Indy Craft Brew did with the new General Manager of Hydraulic Ale Works, Jordan Mullins, click here.